I recently attended the Star Wars: A Galactic Spectacular Dessert Party at Disney’s Hollywood Studios. It is a premium event, which means that there is an extra charge for it above and beyond the price of park admission for the day. The party includes a variety of all-you-care-to-eat foods as well as specialty drinks (including alcoholic beverage options). Party-goers also get access to a reserved viewing area to see both the Disney Movie Magic and the Star Wars: A Galactic Spectacular shows. Each person receives a Star Wars novelty as a souvenir. Here is my take on this stellar experience. Check-in took place at the podium in the Animation Courtyard in front of the Launch Bay, where the party is held. We checked in about 15 minutes before the start time and were given lanyards to wear, which allowed us to enter the party and come and go from the Launch Bay as we pleased. The party itself is in a roped off area down the stairs by the Chewbacca and Kylo Ren meet and greets. There were several buffet tables set up with food and beverages, surrounded by dining tables for the guests. Most of the tables were high tops, with lower ones reserved as accessible seating for people with disabilities. All were covered in black tablecloths and held red glowing candles bearing the symbol of the Galactic Republic. Tables were not assigned, but there was no trouble getting one. On the down side, there were no chairs, though the party is wheelchair and ECV accessible. The rest of the Launch Bay remains open to Studio guests as well as partygoers. Crowds were low when we were there, so we were able get in to see both BB8 and Kylo Ren with little to no wait. Security was provided by a couple of Storm Troopers who patrolled the party. The food is, for the most part, Star Wars themed, and there is a lot of it. The savory choices were more varied than other dessert parties that I have attended. There were green olive and cheddar “sabers” as well as some made with tomato and provolone cheese. Fruit skewers with either grapes or watermelon were a nice touch. There were also two dips served with smoked sea-salted flatbread. The black bean dip with sriracha sauce was delicious, and not overly spicy. I skipped the roasted red pepper hummus, which was also available; I was saving space, and I am glad I did. There was a wide variety of desserts, and most of these did not disappoint. One of the most unique offerings was the flash-frozen Nutella truffle. It is scooped into liquid nitrogen, which freezes the outer layer, leaving the center chilled but creamy. Nutella is not something that I normally enjoy, but this version was truly (forgive me) out of this world. It was accompanied by a choice of raspberry or chocolate sauce; I was glad that I followed the cast member’s suggestion and got both. The cookies shaped like Darth Vader (chocolate) and Storm Troopers (vanilla) were simple but good, especially with ice cream. The warm bread pudding was chock full of everything from M&Ms to pretzels and marshmallows. There was also a choice of toppings that could be added to the bread pudding or used to make sundaes. Despite my voracious sweet tooth, some of the options were too cloying for me. This was true of two of the three types of cupcakes. The R2D2 was vanilla and the BB8 was very lightly lemon flavored, but they were both extremely sweet. For my money, the peanut butter and chocolate Darth Vader cupcake won hands down. On the other hand, I did not enjoy the blue milk panna cottta, which was rather bland. Brownies, a variety of mini cakes and rice crispy treats were also available. About 15 minutes before the Disney Movie Magic show, cast members gathered us at the foot of the stairs. On the way out, each guest got a Tie Fighter popcorn bucket as a keepsake. These were fairly large, and could be hard to pack, (the souvenir may vary — at earlier parties, Chewbacca mugs were the gift). We were then escorted out to the viewing area by the Storm Troopers. It is a great location to the left of center in front of the Chinese Theater. The show is a compilation of Disney films that are projected across the facade of the Chinese Theater. It was 10 minutes long, and included clips from Disney’s greatest hits, including Mary Poppins, Beauty and the Beast, and the Pirates of the Caribbean franchise. This was followed almost immediately by Star Wars: A Galactic Spectacular. Even if you have seen Star Wars fireworks at Hollywood Studios over the years, you have to experience this show. The original version was much shorter and only shown for special events such as Star Wars Days and Star Wars Weekends. It was then expanded and in December 2015 became a nightly show called Symphony in the Stars: a Galactic Spectacular. It focused on fireworks and the musical score from the films. It was replaced on June 17, 2016, with the current show. This version includes fireworks as well as Star Wars film clips, which are projected onto the Chinese Theater and surrounding structures on Hollywood Boulevard. Additionally, there are special effects including flames, fog, lasers and searchlights. It was an impressive and entertaining experience, which lasted around 15 minutes. The Star Wars: A Galactic Spectacular Dessert Party costs $79 for adults, and $39 per child (ages 3 to 9), including tax and gratuities. Disney Dining Plan credits can not be used for this experience. Reservations can be made by phone or online, and are highly recommended, as this event often sells out. While most dining can be booked 180 days in advance, this experience is usually not available until later than that; you just have to keep on checking. Reservations did not open up for us until about 90 days before our party date. Is this party worth the extra cost? To be fair, we are long time Star Wars and Disney nerds, but I think this is a terrific event even for the non-fanatic. It was well organized, and the cast members were great. The food and drinks were good, and there were plenty of choices. In fact, we were fine skipping dinner and eating here instead. Also, we have had problems finding a good spot for these shows in the past, even when the park wasn’t that busy. The Dessert Party’s reserved area afforded us a great view of both shows. We got to experience all of the projections, fireworks and special effects, without wasting park time to stake out a location. Overall, it was a lot of fun. Not only would I recommend it, I plan on doing it again! EDITOR’S NOTE: If you’ve attended the Star Wars Dessert Party, or any of the other dessert parties around the parks, be sure to leave your thoughts in our Rate and Review section HERE. 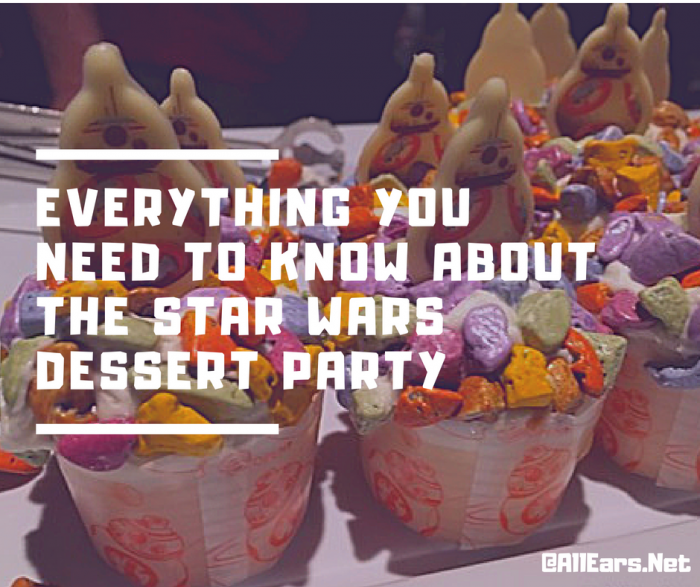 Do you know if the Star Wars Dessert Party will be offered for dates September 1-7? I have the Star Wars dessert party booked for May 25th. This will be the 2nd time we’ve done it. The Disney movie magic show wasn’t available when we first went though. Other blogs and comments have people saying they were thinking of canceling the dessert party if they couldn’t see both shows. Yours is the first that I’ve seen mention that we are walked out to see both. Is that for every dessert party booked? Can’t wait to do it again either way! Thanks for any info. JOAN REPLIES: When you make the reservation, under Know Before You Go, Disney warns that: “Seating is not available. Wheelchairs and ECV’s can be accommodated.” Unfortunately, that is the case, no seating is provided for either the party or the show. You can take the food and sit on the benches that are always in the Launch Bay, but they are few and far between.